The temperature distribution generally affects several aspects including operation of the electrochemical system, efficiency, charge acceptance, power and energy density, reliability, life time etc. Thermal management of battery systems is rather complex. 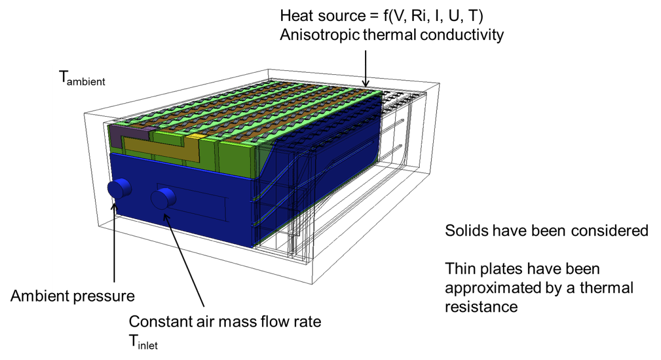 Since the cells have to be heated during idling and cooled during operation, the system contains several temporally and spatially independent heat sources/sinks. Batteries equipped with thermocouples do not show all potential hot spots. 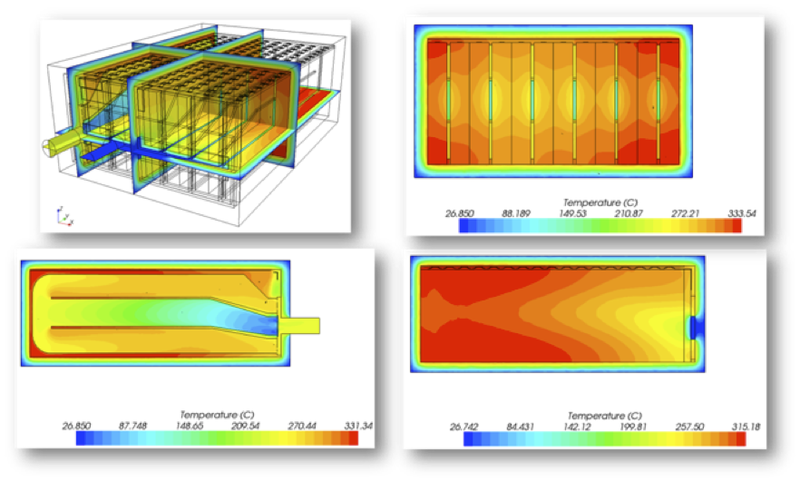 Therefore, CFD analyses help to understand the temperature distribution behavior within the entire battery system during different operating modes which is the base for optimizing the system. The following pictures show the temperature distribution. The air is entering the battery at the front plate and is heated up quite fast when passing the first cells. The plane through the cells shows that the cells at the back are insufficiently cooled. The corners of the box show hot spots. Furthermore the analysis showed that the incoming flow is heating up by the hot outlet flow before entering the cells because inlet and outlet are both arranged at the front panel. The following picture shows the streamlines of the cooling air and the temperature distribution in a horizontal plane. The optimization steps leaded to a more uniform temperature distribution and therefore to higher life times and higher power and energy densities.